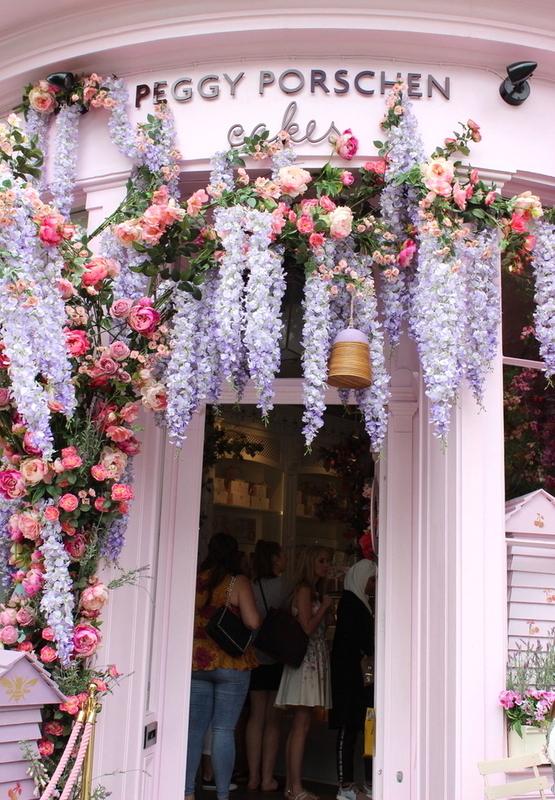 For so long I'd admired Peggy Porschen and many of the beautiful pink houses and doors of London from an online kaleidoscope of hope but never actually made it to any of those stunning places myself. Since last summer Graham and I had planned to do our own "pink London tour" and finally in June this year we got the chance. As well as showing you some gorgeous picturesque places, I also wanted to be frank about my lifelong battle with London since I was a little girl. It symbolises anxiety for me, not to mention a whole book of bad memories that I'd rather forget. So as well as taking you on a pink London tour full of fun and frolics, I thought I'd first explain how London has affected my anxiety in the past (I intend to do a full post in the future about my anxiety from the very beginning, so will keep it vague for now). Central London is a quick twenty minute train ride away from my doorstep but I never go because in all honesty I hate it. London reminds me of terrifying times in my life; experiencing my first panic attacks there as a little girl, enduring a crappy work experience placement at my (not so) favourite magazine and getting lost on my own late at night after a meet-up with an online friend turned into disaster and left me with a low bout of self-confidence. Thankfully Graham and I both share a dislike for the city; the crowds and smoke, the rudeness, the crushing rush of the capital are all downsides for us. We have our beloved Bluewater which provides us with all the shops, cocktail bars and films we need whilst we have our pick of the beaches which are much more our scene; fresh air, calm, quiet and the soothing sea. Craving Southend as I type this, dude. I'd be lying if I said I loved London, and although this post is a happy one, I had to give you a little background on my battle with it. We had a perfect day, but as always when I arrived home from the city I was left with a headache from the stress of the crowds. The relief to be out of London was overwhelming, but whilst we walked the streets to find all the pretty pink places and indulged in Peggy Porschen cakes, I loved every moment. I've been to London three times in total this year, all happy occasions. I'm glad I can enjoy going if and when I decide. It's a stepping stone. 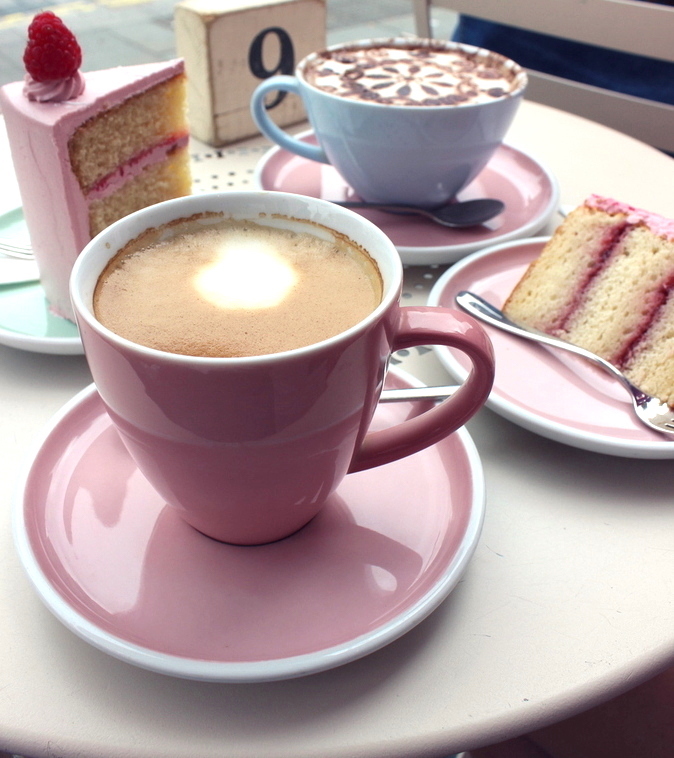 Our first stop-off point on the pink London tour was Peggy Porschen. 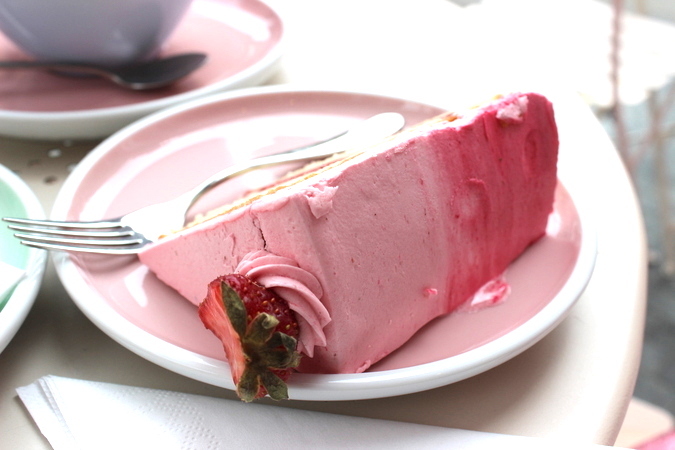 The fancy cakes fuelled us for all the pink prettiness that lay ahead. I've been here three times now and it lives up to the hype 100%! First I went with my mum back in March as a late birthday present after I got back from Barbados. Determined to sit outside despite the sub-zero temperatures, the staff gave us pink blankets to put over our knees and were unbelievably lovely. I was so impressed with how sweet they were. Because Peggy Porschen is such a sought after cafe I expected to feel a little intimidated by it all, staff included, but I needn't have worried as they are beyond kind. My second visit with Graham on the pink London tour was just as perfect. The weather was breezy and balmy. Not quite the sizzling temperatures we're experiencing now, but still hot. We enjoyed slices of Strawberry Champagne cake and Raspberry cake. It is a bit surreal seeing so many people out front capturing photos of Peggy Porschen, a real life Instagram huddle of hysteria. I'll be honest with you and say that a lot of people getting photos seem to lose all sense of their manners as they clamber for their perfect Peggy Porschen insta moment... my mum and I waited patiently to take a few pictures and once it was all clear two girls had the nerve to tut at us for getting a mere few photos (and when I say "mere" I really mean it, I felt too self-conscious to stand there for long at all). Note to people like that: you're being twats. 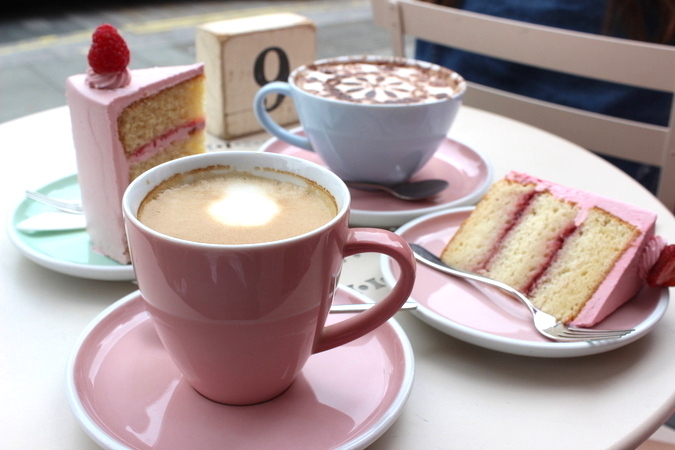 Peggy Porschen is for everyone to enjoy so let others capture some lovely photos too and stop being so selfish! Another reason why I don't come to London; I don't have the patience for it! Overall though, I absolutely loved it. Mum and I had another pink tea date there a week after Graham and I went, and are arranging an August date as we speak. There are so many gems! Graham sweetly drew up a map of the houses I'd found online and we followed his route throughout the day. 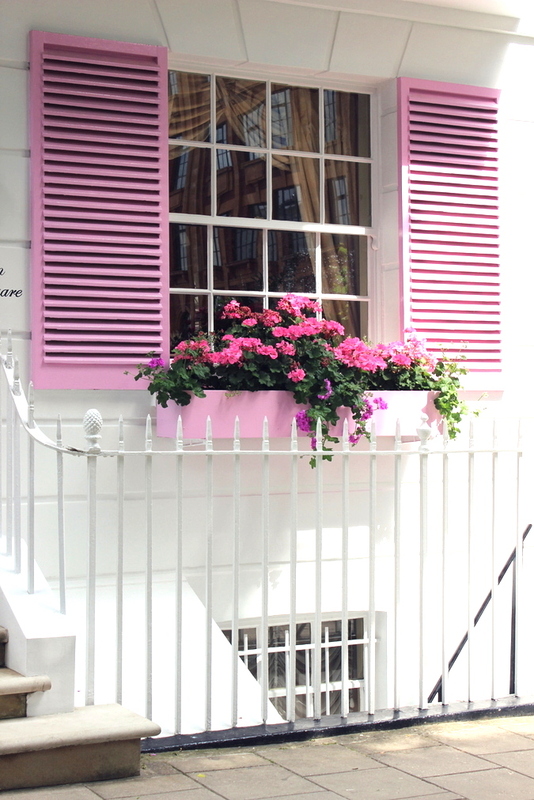 After Peggy Porschen we wandered through Kensington and Chelsea, to this gorgeous bright street. The pink house was one I'd had a long-time love affair with and the woman who lived in the house was on her front door step. She was just going in so we said hello and complimented her on her pretty pink house. "It's fun, isn't it!" She said. 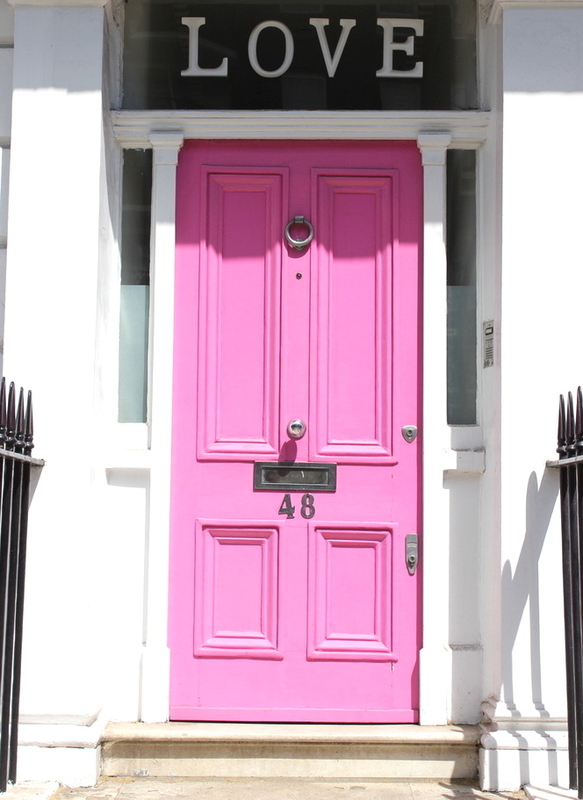 We asked her if she minded whether we got a few quick photos of me outside her house, and explained about our visit to see lots of pretty pink places, that I had a fashion blog, and a love for pink. The sweet lady couldn't have been lovelier, and she said we were the first people to actually ask her permission for getting photos outside her house. We had a conversation with her for a while, and she told us she wanted to paint the house pink as it was fun and bright. My idol! We only got a few pictures as we didn't want to disturb her, then thanked her and went on our way. 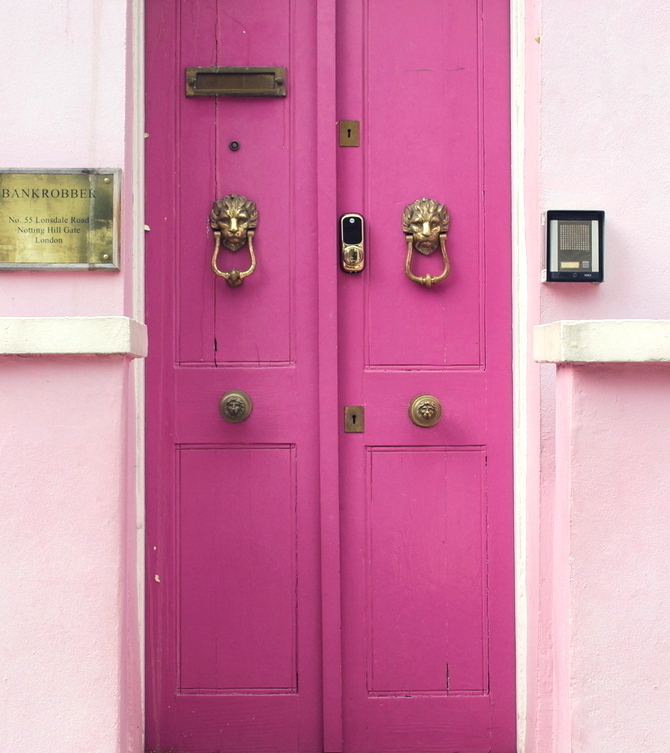 Notting Hill is always a good idea. Graham and I have been here a couple of times, it's always beautiful. 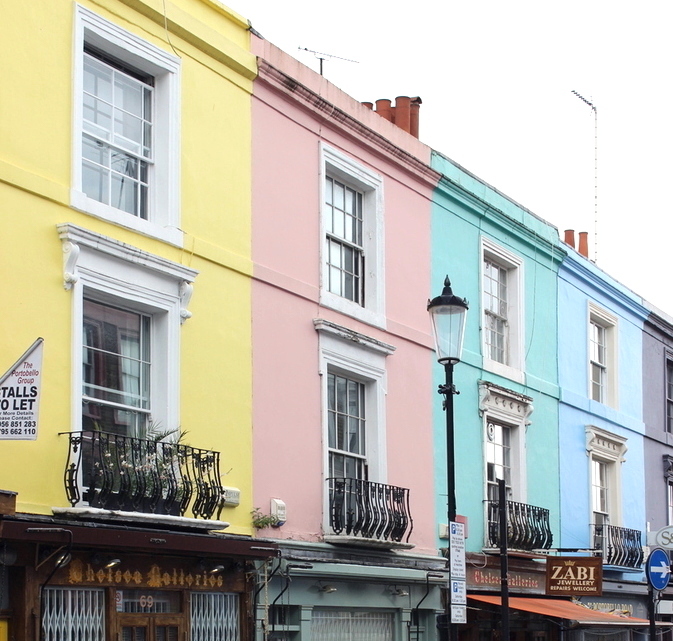 The pretty rainbow coloured street is true treasure, and this pale pink shop was a bonus that we happened upon. Just before I started my blog Graham actually took me on a "Notting Hill" tour, to see the key places featured in the movie. Nearby we found this little pink babe with the gold lion knockers. 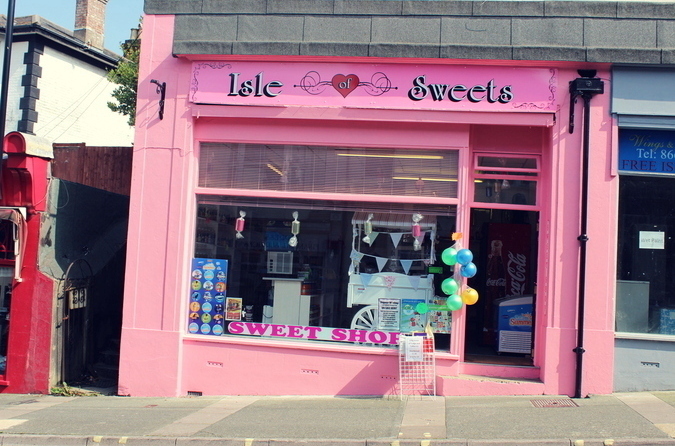 This place reminds me of a pink sweet! Another unexpected treat that we stumbled upon, I'd forgotten all about this until we feasted our eyes on it in real life. On our way to find our last door, Graham stopped in the street and gave me a funny look. I spun round to come face to face with these massive eyes looking at me, it actually made me jump! The eyes are even bigger in real life than they look in the photos! Eyeballing me! We fell about laughing, it was the cutest sight. One of my favourite doors, for sure. I'd love to know which door/house is your favourite! How lovely, Sophie!! I adore how supportive Graham is, what a sweetie to map all of that out for you. These sightings are absolutely dreamy. I wish I could see them all for myself! Thank you for sharing all the pink with us!! I'm so glad that London has been enjoyable for you. I hope it continues to bring you ALL the happiness, my love! Besides the rude ones.. haha. Do ya thing, babe!!! Seriously love all of these beautiful pink spots! That door with the eyes was too cool! Makes me want to do that to one of my doors. haha. Oh very interesting post~ Always is hard deal with anxiety. I definitely can relate to parts of your anxiety being tied to a specific location, especially as someone who used to really struggle to even leave my dorm in my first year of college because I would get so anxious. 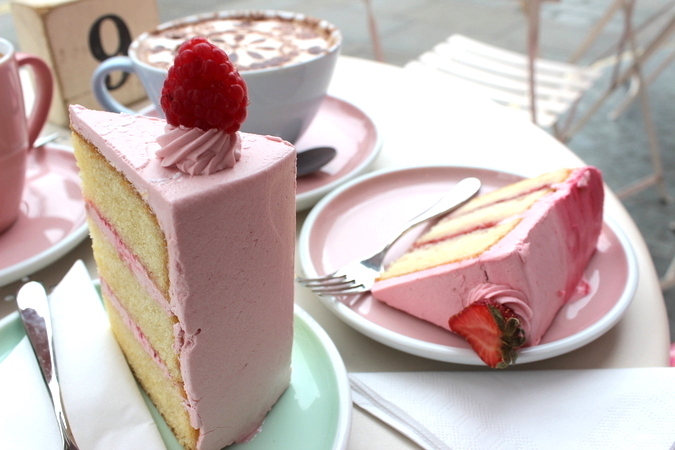 In other news, that cake looks absolutely delicious! And all those pink and purple buildings have me completely heart eyed over here in Chicago! Lots of love for ya, keep on doing what you're doing! I'm going to London and I'm going to visit this beautiful place, thanks for the tip and beautiful blog. I love this post! It couldn't be shabbier if anyone tried, this hue of pink makes everything look cozier. I love it! Literally my dream house!! Lovely photos you look gorgeous! London just ain't for me Sophie. I get panicky and anxious whenever I visit there. Is just too much people rushing everywhere and I can't deal with the undergrounds. Ha!! 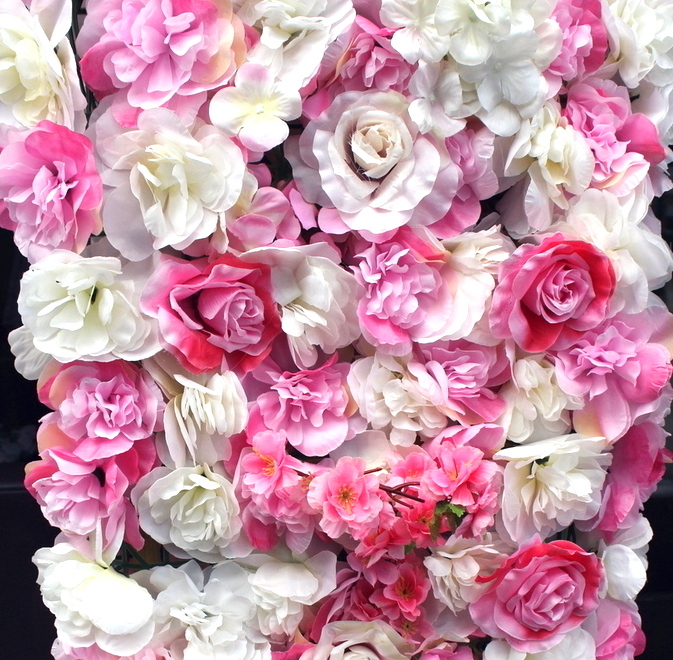 Peggy Porschen is definitely famous on Instagram. Almost every blogger has visited. Makes me feel left out. Lol!! You look wonderful in this checkered number. 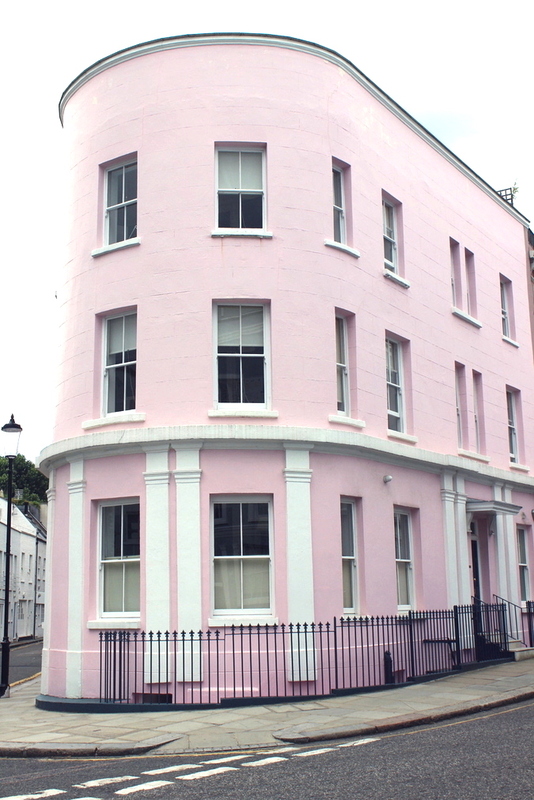 I gotta visit Notting Hill some day. Love the coloured street. Such a gorgeous photos! 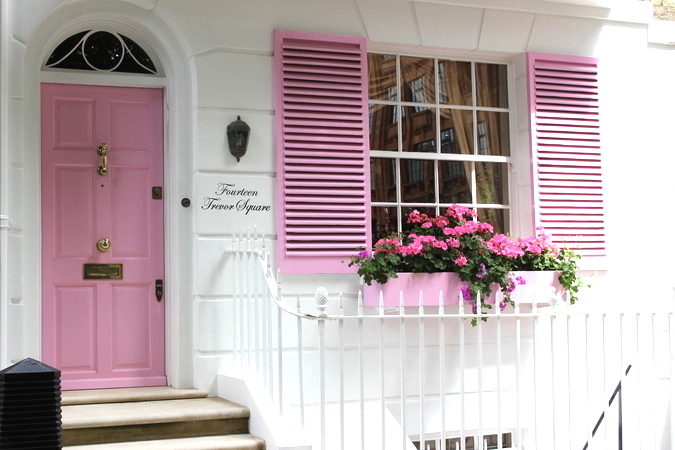 I also really like pink houses and Pegggy Porschen is on my list to visit! Thanks for sharing your impressions! Awwwww! I loved everything on your blogpost, Sophie! Enjoyed reading and looking through the pics, wish it didn’t end. Haha. Your man is such a good man if he supports you with your passion, likes, hobbies especially when it involves pink! Not a lot of men are able to do that! He’s patient in that matter. My husband is not so even when taking pics of me! Hahaha just kidding. Hope you two have a lovely day! And hi to your mum too! Wish someday, maybe, *fingers crossed* I’ll use this blog post in the future for a pretty Pink tour too. Who knows.. Haha. Loving how pink everything is. I had a panic attack in London not so long ago and ended up doing a work placement I hated there. I have to admit that it’s not one of my favourite places. Such gorgeous images you captured Sophie. Notting Hill is one of my favorite movies of all time! 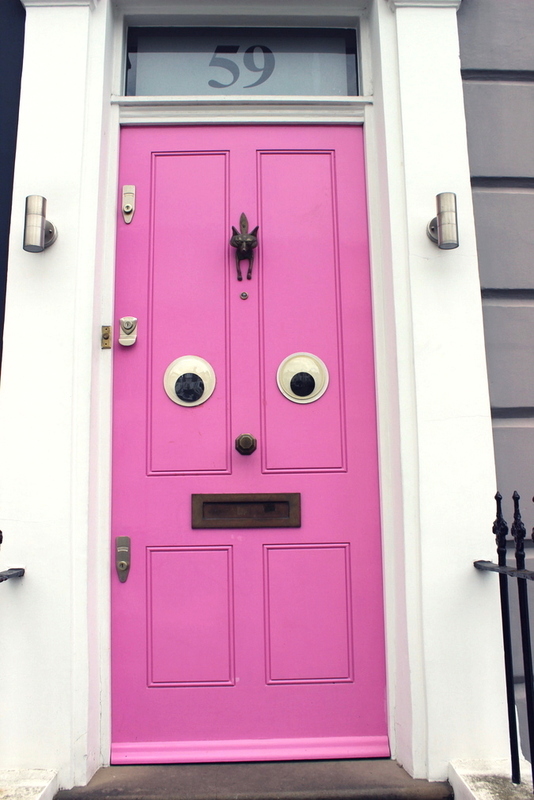 The googly eyes door is my favorite and my favorite house is the last one that you said reminded you of Malibu. Sorry to hear about the anxiety you experience when you are in London, I can tell how bad it is because it still affected you a bit with the people trying to get pics in front of the buildings. Some people are just plain rude, and I have to say that it helps to laugh it off for me because that way their ridiculousness doesn't affect me as much. I agree it is annoying! You look incredibly beautiful in your gingham dress with the pretty house as your backdrop. Adore the style you chose to wear! Girl what a beautiful post! Well done! omg, so many gorgeous photos. Makes me wish I lived closer to London! Might have to start looking at unis in London! How sweet of your man to make a map for you! What a lovely post - so glad to hear you overcame your anxiety! It's very easy to have a love/hate relationship with London because of the chaos so I know how you feel!